The five-day event was organised by Castleford and Pontefract Renaissance to generate a vision for the five towns of Castleford, Featherstone, Knottingly, Normanton and Pontefract. Growing numbers of residents are getting involved with professionals in shaping their local environment. This website is an essential starting point for everyone concerned. It provides easily accessible how-to-do-it best practice information of international scope and relevance. How the site is structured and how to use it. The main sections of the site are accessed from the menu down the left hand side of the screen. Material within sections is listed alphabetically wherever possible. Explains what makes the site work and who is involved. Provides general introductory material about the subject and how to get started. 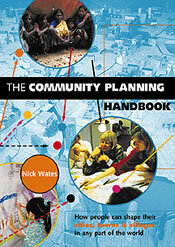 Sets out universal principles which tend to apply to any community planning activity. A Methods A-Z provides summaries of all the main methods for helping people get involved in physical planning and design, with links to further information on this and other sites. Featured methods covers in detail a selection of the most effective methods. The purpose and main features of each is summarised on the opening page with checklists, sample formats, costs and photographs in separate tabs. Further information links are provided in a scroll down menu at the bottom. Shows how a number of methods can be combined in an overall strategy. A range of scenarios cover some common development situations. The opening page provides a summary of the scenario with a detailed activity sequence and timeline in a second tab. Further and related information can be accessed from menus at the bottom of the page. Examples of community planning in action. Real people, real places, real results. Contains a selection of detailed case studies and links to case study collections elsewhere on the internet. A summary of policy and legislation on community planning in different countries and in international agreements. Contains checklists, forms and timetables which may save you time. They can be viewed on screen and downloaded so they can be adapted for your own use. Private consultants who can provide support. Organisations providing further information and support. Funding mechanisms and sources of funding. Explains common terms and provides cross-references. This can very productively be used as an index to the site and to the subject. Things communities can do to make neighbourhoods better to live in and more sustainable (particularly, produce less carbon emissions): projects; programmes; initiatives. Intended as a checklist to stimulate creative planning. Entries are brief summaries of actions which communities can take and provide links to more detailed information or examples. Listing of real community planning projects and events with links to further information. Useful publications and films. Includes historical classics and up to date guidance. Some of the most useful websites. Direct access to the Supporting Communities and Neighbourhoods in Planning, England, programme. A section devoted to special coverage of issues of current and historical interest. 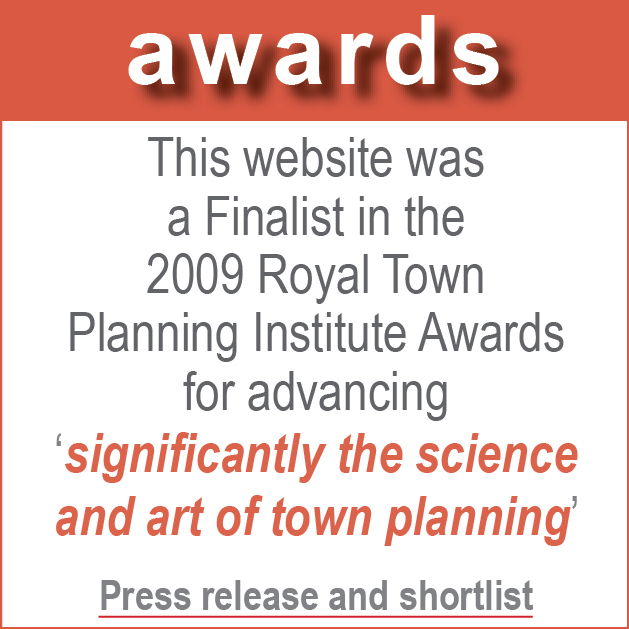 Includes access to features on Neighbourhood Planning and Low Carbon Communities in England. View some of the best community planning videos from YouTube and slide shows from Slideshare. Find out about the latest site developments. Download logos and posters and see web statistics summaries. Makes it easy for you to help us build and improve this website. There are also feedback templates in many sections of the website for providing specific data. And don't forget the Site search facility in the top right hand corner. Type in a word or phrase and see what comes up. It has been decided to make all the material on the site available to all internet users free of charge. There are no fees for accessing or downloading anything from this site. This means that the considerable costs of maintaining and developing the site have to be met in other ways. A price guide is provided below for standard items but a written quotation will be provided and approval secured before work commences. For more details please see the advertising tab on the Marketing page. Where funding from other sources is not available, those requesting amendments or additions will be charged a fee to cover the cost of the work. A written quotation will be provided and approval secured before work commences. Prices may be adjusted depending on the complexity and quality of the material. Quotations for compiling special features or other material not listed above can be provided on request. The copyright on the compilation that comprises the Community Planning Website is held by Nick Wates or Nick Wates Associates. The copyright on all text and photographs on this site is held by Nick Wates or Nick Wates Associates except where specifically stated or as set out below. It is the intention during 2007/08 to create an independent body comprising stakeholder interests which will also hold rights to the material in the long term. Material submitted is assumed to be copyright free except where specifically stated. Nick Wates and the new independent body mentioned above shall have the right to use material submitted on The Community Planning Website and in any related publicity or publication unless otherwise agreed. Those submitting material will also have rights to use the material they submitted as edited on the website for their own purposes. Photograph credits and copyright information are (or will be) provided alongside each photograph on the site. Photographs not otherwise identified are copyright Nick Wates. Please notify us of any errors. It is assumed that those submitting photographs have cleared all relevant permissions or have supplied information about copyright. Most of the photographs on this site are of people taking part in public or semi-public community planning activities of various kinds. Those featured were generally aware that photographs were being taken and in some cases have specifically given their permission. But if anyone is unhappy with appearing in a photo on this site, please send an email identifying the photo and yourself. The photo will then be cropped or removed. How people can shape their cities, towns and villages in any part of the world. Compiler and Editor: Nick Wates. Design and production: Jeremy Brook, Graphic Ideas, Hastings. Advisory Group: Roger Bellers, John Billingham, Roger Evans, Nick Hall, Birgit Laue, Arnold Linden, Jenneth Parker, David Lunts, Michael Mutter, Renate Ruether-Greaves, Jon Rowland, Ros Tennyson, John Thompson, John F C Turner. Copyright © Nick Wates, 2000. ISBN: 1 85383 654 0. Supported by The Prince¹s Foundation (and formerly The Prince of Wales¹s Institute of Architecture), this initiative promotes good practice through the production of high quality, uiversally applicable, how-to-do-it information using participatory editing techniques. Funded by the Department of the Environment, Transport and the Regions (DETR) for England, this action research programme assisted and evaluated 12 public participation events and 10 seminars in England during 1996 and 1997 to establish good practice principles. A research project funded by the European Community and based at London¹s South Bank University. The production of this book has been guided by the belief that participatory editing and testing of good practice guidance is one of the most effective ways of achieving widespread improvement of practice and knowledge transfer. Overall concept established by the author, designer and supporting organisations. Call for information leaflet distributed widely. Monitoring and evaluation of pilot projects, participation in seminars and workshops, desk research. Ten methods and four scenarios published in Urban Design Quarterly, July 1998. Over 1,000 copies distributed. Also available on Urban Design Group web site. Held at the South Bank University in London, November 1998, and in the Philippines, January 1999. Circulated to over 60 practitioners. Over 35 responses received. Circulated to main supporting organisations and advisors. Feedback received at each stage has been invaluable in developing the book, although the editor takes full responsibility for all views expressed. It is planned to continue the process with further editions, translations and adaptations tailored to specific local contexts. Feedback from this website of course plays an important role. 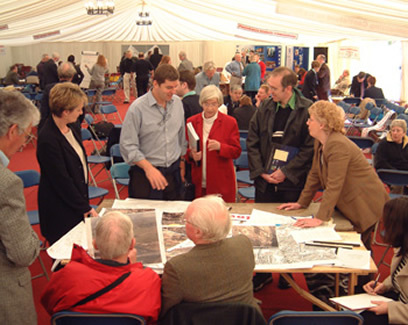 Communityplanning.net champions promote the site in their own specialist fields or localities and advise the editorial team on improvements needed. If you would like to be a Communityplanning.net champion please email the site editor. The Rt Hon Hazel Blears MP, Secretary of State for Communities and Local Government, speech titled ‘Beauty vs. brutality’, 25 March 2008 at The Commission for Architecture and the Built Environment (CABE), London “The site communityplanning.net sets out a host of great ways to encourage debate - from 'design fests' (specialists spend the day discussing their ideas for a neighbourhood, while the public has an opportunity to walk in, watch and comment) to 'photo surveys' (people bring their own photographs of what they like, or don't like, about their neighbourhood now as a way of starting discussion on what they want to happen to it next) to 'planning for real' (using 3-D models to show residents what development could look like, and giving them a chance to vote on the options). "I have just gone over this site briefly and it is excellent, a great tool for community and personal planning as well. If the community uses this guide our events could not go wrong. Thanks for doing this." "Great site--many thanks for your work."